My love of color and texture has taken me on a journey from being a glass artist to the fiber arts world. For the last 10 years I have explored spinning, dyeing and weaving. With a side trip into owning a yarn shop for a few years, I am now back to creating fine handwovens, handspun and hand dyed yarns, in my log home studio in the beautiful hills of southwestern Wisconsin. Weaving brings an aspect of functionality to art that I enjoy. It is hard to describe the wonder of being at the loom and watching your fabric grow with each throw of the shuttle. 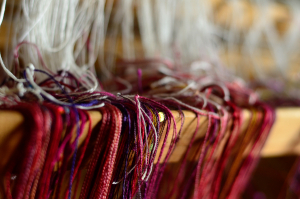 Fiber is a wonderfully tactile medium and the rhythm of weaving is very meditative. I am very drawn to the interplay of pattern and texture in weaving. And then throw in color and how they are affected by each other in the weave; It will take me a lifetime to learn all there is to learn about weaving. 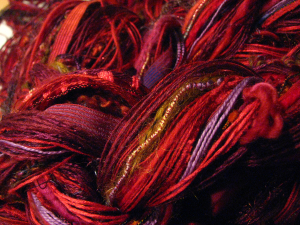 I have been spinning and dyeing yarns for many years and at times incorporate them into my handwovens. 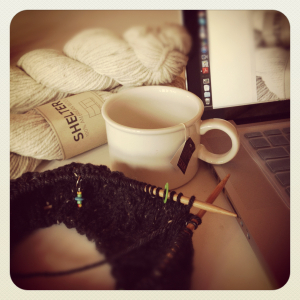 Spinning yarn is a very centering and peaceful craft. Unless I am spinning one of my funkier artyarns, which can sometimes be like shoving the whole sheep through the spinning wheel. I have worked in stained glass for the past 30 or so years and it occasionally calls me back. But now instead of windows, I fire up the torch or kiln to make beads and dichroic glass jewelry and buttons. Glass draws me through color and the transmission of light through that color. Making torch-worked beads has the added thrill factor of playing with fire and scary tools, like the torch. I still jump about a foot every time the torch pops. These two such different mediums continue to delight and inspire my creativity.